When we run a detailed comparison of Tasker vs Automate, Tasker seems to the most effective choice for several reasons. Let's know about both the apps deeper in the further section. Also, let's have a look at the pros and cons to understand them better. Tasker is the most reliable automation app for Android but it could be little hard to set up for beginners as it is complicated. The tasks that are done are mostly related to application, time, date, location, event or home screen widgets. Tasker is one of the most popularly used Android apps that perform automation based on condition triggered tasks. If you're a naive user and do not know much about its functionality, then all you need to do is check out for some Tasker profiles and third-party plugins. Tasker is not a piece of cake as you need to put a lot of effort to master it. Although Tasker has tremendous potential for automation related tasks, it isn't easy. You have to do a lot of learning to know it's mechanism properly. But if you are a user who is just looking out for some simple profiles, then you're good to go. This simple idea enormously increases the control of your Android device and it's potentiality without the necessity of root or special home screen. Applications that are pass code lock sensitive explicitly designed for child safety. Changes your wallpaper or home icon every day. Frequent Backup of files on SD card. Tracks your phone location in case of theft. Launches a music app when headphones are connected to your phone. Shows a pop-up when a new message is delivered. Automate implements automation tasks using a unique approach - that is the flowchart approach. The concept is straightforward. You have a grid and your task is to choose different blocks of predetermined class and connect these blocks over the grid. You can also reposition these blocks as per your wish by simple drag and drop mechanism. It is also possible to change connections whenever you want. As a whole, Automate is considered to be one of the most interactive and user-friendly tasker alternatives for automation tasks in Android. Highly customizable: Tasker possesses a magnificent amount of triggers, actions and parameters that can be used in many numbers of ways. In addition to that, it accepts scripts to follow instructions. Creates powerful tweakable applications: Tasker is capable of creating personalised applications, productively replacing all the multiple apps with tasks that are performed by Tasker automatically. The best part about this being it's customized and works according to your needs. Ability to modify system software: since it has root access, it can alter the system software which I'm sure no other apps will be able to do. It exports tasks as standalone applications: Tasker permits exporting workflows that you have designed as standalone apps that can be shared or even stored in Google Play Store. Great plug-in support: Tasker has great plug-in support to connect with hardware that frequently involves installing particular apps. For instance, Tasker has a plug-in for Pebble smartwatch. You can automate tasks using this for Pebble smartwatch. Purchase only once: Once you purchase this app, you don't have to spend again as there are no revised apps as such. Requires a lot of learning. 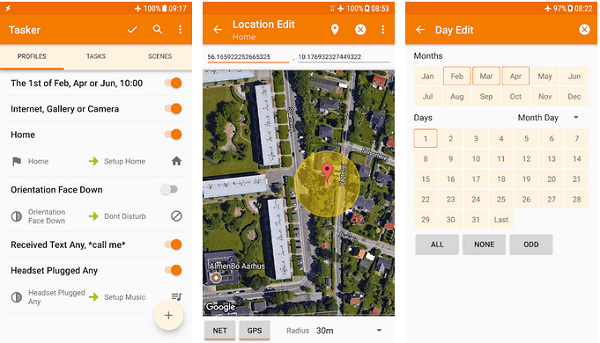 Tasker doesn't offer proper documentation or tutorials about its features. As the learning curve is high, you need a learning material to have a clear cut idea about its advanced features. Although it's amazingly powerful, Tasker's the user interface is confusing and vague with outdated features. It involves more than 250 blocks. 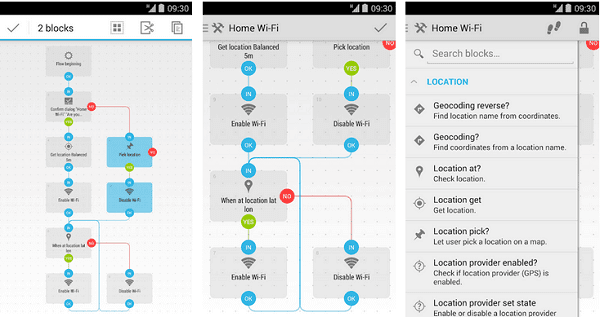 Maintains Tasker and locale plug-in. You can run up to 30 blocks simultaneously using the free version. No drawback of functionality. Much simpler than Tasker and easy to use. Since flowcharts are used, it is simple to visualize the logic and you can drag and drop blocks instinctively. Exports profiles as launcher home screen Icons. Automate cannot build interactive graphics overlays and dialogs. Therefore can't build custom scenes. You can't export the profiles as independent apps. Although both Tasker and Automate performs a similar task - that is, performing automation tasks in android devices, they have their own pros and cons. Both perform incredibly amazing in terms of their performance, speed and many other factors. Ultimately it's your choice to decide and select the one that best suits your requirement.